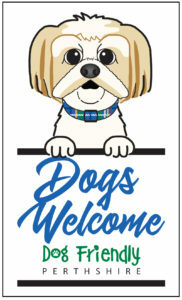 I was quite surprised and saddened recently to be told after a Perthshire business announced they were going to do a trial run of allowing dogs on their premises they received quite a bit of negative feedback. Comments made were the dogs would be smelly, make a mess of the premises and just be a general nuisance. Even that they could contaminate the food. For years I worked in the hospitality industry in hotels and bars which were dog friendly. In the time which I worked in the industry I never once had a dog that destroyed property, was smelly or misbehaved. There would be no risk of food contamination as dogs would not be allowed where food is prepped or stored. I did however deal with guests who were rude, disruptive, damaged or even stole hotel property. I have found dog owners who take their dogs to dog friendly establishments are very responsible and will always make sure their dog behaves themselves. I personally think it’s brilliant that so many places are becoming dog friendly as I love being able to take Baxter with me while I go for a coffee and even know that we can go away for a weekend and not have to worry about finding a dog sitter. I really hope to see many more places allowing dogs in the near future as they will always get a big thumbs up from me and waggy tails from Baxter.